'Big Bettie' 340 x 240 $15 monthly Large and in charge. These ads get top billing. Not quite as large, still in charge though. These ads are placed under the Big Betties. Smaller in stature, but as they say... well, you know, small packages and good things? These are placed under the larger ads. Ads will run for 30 days. Includes inclusion in a monthly "Sponsor Love" post and social media shout-outs. Ads will be randomly rotated throughout the month. Payment via Paypal only. Click here view my complete blog bio and current stats. Why advertise on I Know all the Words? As a blogger, I've slowly built up a following of fabulous readers and while my blog is growing day by day, I know what it's like to struggle to get your blog seen (and get the attention you deserve!). I'd like to be able to showcase other amazing blogs, and give them a bit of the limelight and help them grow as well. 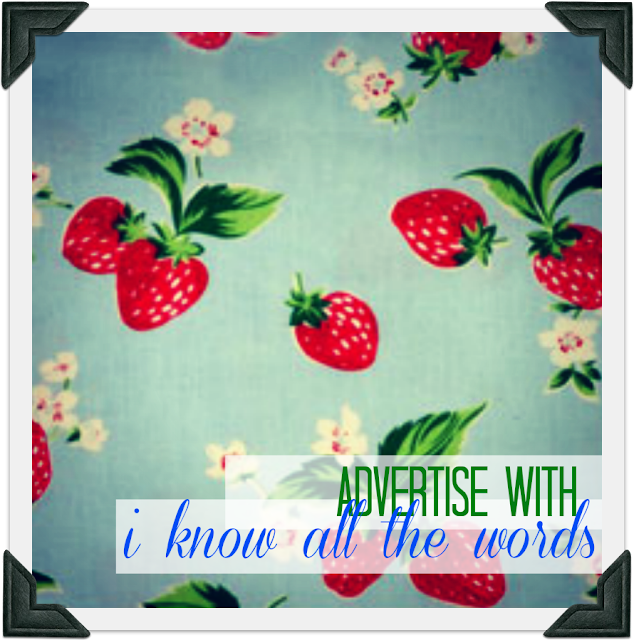 If you decide to advertise with me, thank you! If need a button designed, no worries, I am able to work with you and create a little something you'll love, free of charge. Your sponsorship includes inclusion in a "Sponsor Love" post all bout you and your blog. It also includes promotion of your blog on Twitter and Facebook. Not too shabby, right?! 20% Discount if you sign up for 3 month increment.